Within the subspecies of Eastern Gorillas there is variation in what they eat and how they obtain it the one thing that is constant in all the groups is the fact that they alternate throughout the day with periods of resting and feeding. All gorillas are diurnal which means that they are active between 6 A.M. and 6 P.M. 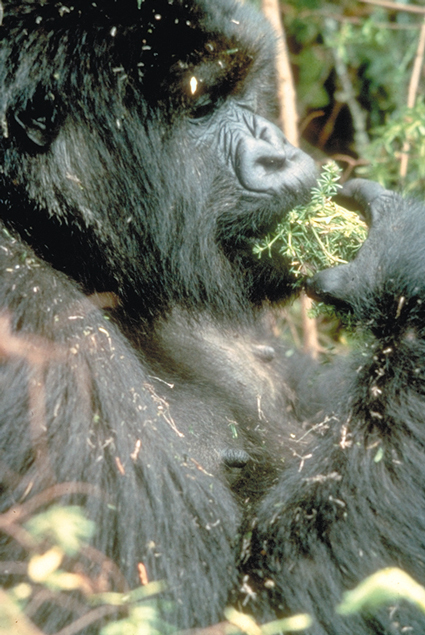 The diet of the Eastern Lowland Gorillas is anchored by a steady intake of leaves and pith but, it is very diverse and includes fruits, insects, seeds, bamboo, and shoots. They will eat fruits when they are abundant and during this time fruit actually makes up a quarter of the Eastern Lowland Gorilla’s diet. When eating insects the Eastern Lowland Gorilla prefers ants. They usually forage in a small area for a few days and then travel long distances sometimes reaching distances of 154 and 2,280 meters per day. 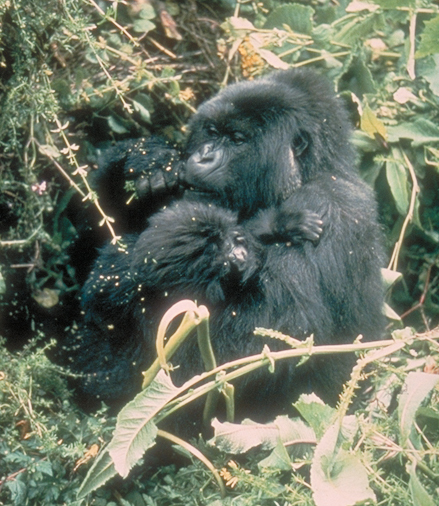 Mountain Gorillas have a similar diet consisting of leaves, stems, pith, and shoots. They also eat a variety of other things including bamboo, bark, wood, roots, flowers, celery, thistles, and fungi. These gorillas will also eat certain invertebrates such as ants, worms, and grubs and sometimes wild berries when they come upon them. Since they have an extremely flexible diet they don’t have to move as much allowing them to travel under 500 meters in search of food on a daily basis. The Bwindi Gorillas have a very similar diet to that of the Mountain Gorillas but with them being in an entirely different forest there are some differences such as the higher fruit intake. This is due to the fact that Bwindi Gorillas are much more likely to climb trees and travel long distances to find foods. In fact during some months the Bwindi Gorilla diet is similar to that of the chimpanzees that inhabit the forest with them.